Ver 2.6: * updated database engine (3.27.2). Ver 2.5: * updated database engine (3.26.0); * other fixes. Ver 2.4.3.1: * other fixes. Ver 2.4.3 Beta: + SQLiteViewer.ini for manual setup: [SQLiteViewer] EmptyDefinedType=0 - data type for empty field declaration: 0 - auto, 1 - text, 2 - Blob (present in Setup dialog); PreviewTextBlobConvert=0 - additional data convert from Blob to text (present in Setup dialog); PreviewTextBlobConvertMaxLen= - max size of data to text convert from Blob (-1 - without limits) (present in Setup dialog); * other fixes. Ver 2.4.2 Beta: * changed behavior of get data from some fields e.g. BLOB; + SQLiteViewer.ini for manual setup: [SQLiteViewer] * CheckFieldIsURL=0 - now is first x records processed (0-20) for count field as URL (http:// or https://) when table loaded; * FixDateTimeField=1 - try properly show DATETIME, DATE, TIME, TIMESTAMP fields: 2 - extended checks, 3 - as text (default 1); * other fixes. Ver 2.4.1 Beta: * errors fix. Ver 2.4 Beta: * fixes and improvements for records deleting; + column filter by Alt-Click on cell with data, cancel filter - Alt-Click on same data in any cell or from menu (not compatible with Search panel filter); + SQLiteViewer.ini for manual setup: [SQLiteViewer] AllowColumnFilter=1 - allow column filter by Alt-Click on cell; ExportCsvCommaSeparated=0 - comma is delimiter when export to CSV; ExportCsvTitle=1 - export title (header) to CSV; ProcessMalformedTables=0 - open malformed tables (errors may occurs! ); OpenEmptyDatabase=0 - open database without tables (only when SkipSystemTables=0 and AddMasterTable=1); * other fixes. Ver 2.3: * updated database engine (3.23.1); * other fixes. Ver 2.2.1: * when CreateFakeFTS=1 now create additional token FTS5 and module csv; * other fixes. Ver 2.2 Beta: * updated database engine; * databases now opens in real read only mode (not just execute "PRAGMA query_only") (DatabaseReadOnly=1 in ini); + simple export to csv, xlsx, html, rtf; + SQL syntax highlight on 'SQL' page in Table Info dialog; + view next/previous record in Record View window; * other fixes. Ver 2.1.1.1: * fixed draw up and bottom panels when Classic Windows theme enabled; + SQLiteViewer.ini for manual setup: [SQLiteViewer] * SkipSystemTables=1 - by default now system tables not added to the tables list; AddMasterTable=0 - add sqlite_master table when SkipSystemTables is off; * other fixes. Ver 2.1.1: * changed odd and even rows draw (in Setup); * in Record View window TMemo replaced on TRichEdit; + SQLiteViewer.ini for manual setup: [SQLiteViewer] * AskGotoEnd=2 - ask go to last record by Ctrl-End when PacketRecords enabled regardless GetAllRecordsCountN enabled or not; OldGetData=0 - get text data from tables as in 1.x versions (present in Setup dialog); GridContrastLines=0 - contrasting separating lines in grid when non Classic Windows theme enabled (present in Setup dialog); GridHorizontalLines=1 - horizontal separating lines on/off (present in Setup dialog); DrawNullText=0 - text (null) in empty cells (present in Setup dialog); GridColor= - grid color (system Window color by default); GridDrawFocusRect=1 - focus rectangle in active selected cell (present in Setup dialog); GridRowHighlight=1 - full grid row highlight (present in Setup dialog); * other fixes. Ver 2.1: * sorting with Ctrl key now starts after release Ctrl; + SQLiteViewer.ini for manual setup: [SQLiteViewer] GetAllRecordsCount=0 - calculate records count; GetAllRecordsCountForce=0 - force calculate records count in table; PacketRecords=-1 - load data by packets (512 or 1024 is recommended minimum); AskGotoEnd=1 - ask go to last record by Ctrl-End when PacketRecords enabled (work only when GetAllRecordsCountN enabled); ShowSearchPanel=0 - show search panel; AllowSearchPanel=0 - allow show search panel by pressing Ctrl-Shift-F; DrawMultilineTextAsEditControl=0 - force wrap multi line text (draw glitches can occurs); CheckFieldIsURL=0 - check field is URL (first record check, http:// or https://) on load table; FixDateTimeFieldDefault=0 - by default date/time fields will be represents as text; PreviewRTF=0 - RTF preview; PreviewDBGraphic=0 - check special header on graphic preview (Paradox graphic BLOB); PreviewJPEGScale=1 - prefer JPEG size preview for load speed up (0 - as is, 1 - screen size, 2 - half screen, 3 - 1/4 screen, 5 - 1/8 screen); * other fixes. Ver 2.0: * changes behavior of get and show text from text/memo/blob fields; * main grid changed; * FixDateTimeField=1 additional try recognize date/time for DATE fields and REAL format; + sort on several column clicking with hold Ctrl key (sorting can be removed with Ctrl key also); + several lines for records in grid; + panel for preview text/images for selected cell (text additional is UTF8 checked); + simple dialog for search by Ctrl-F (next continue search by F3); + SQLiteViewer.ini for manual setup: [SQLiteViewer] CreateFakeFTS=0 - create FTS and ICU tokens when database is open (only for hide errors when some table opens, other errors can occur! ); * other fixes. Ver 1.9.6.7: + SQLiteViewer.ini for manual setup: [SQLiteViewer] FontName= - font name, FontSize= - font size; * other fixes. Ver 1.9.6.6: * BlobAsTextLimit may be increased up to 20000 characters (20..20000, default 150). Not recommended set big values! ; * StringLengthLimit may be increased up to 20000 characters (20..2000, default 255). Not recommended set big values! ; * small memory leak fixed. Ver 1.9.6.5: + row count limit when load table (enabled in Setup); * other fixes. Ver 1.9.6.4: * other fixes. Ver 1.9.6.3: * updated database engine; * other fixes. Ver 1.9.6.2: * strings sorting fixed. Ver 1.9.6.1: * updated database engine; + sort tables names (view's names sort separately). Ver 1.9.6: * updated database engine; + allow delete current record (if database opened in read/write mode (DatabaseReadOnly=0)). Ver 1.9.5: * updated database engine; + SQLiteViewer.ini for manual setup: [SQLiteViewer] FixDateTimeField=1 - try properly show DATETIME fields (default 1). Ver 1.9.3: * behavior of TAB button fixed in TC x64; + SQLiteViewer.ini for manual setup: [SQLiteViewer] SpecialCheckQuery=0 - if database opened in read/write mode (DatabaseReadOnly=0) and query not start from 'select' then reopen table or database after query (default 0). Ver 1.9.2: * updated database engine; + SQLiteViewer.ini for manual setup: [SQLiteViewer] DatabaseReadOnly=1 - open database in read only mode (default 1); * other fixes. Ver 1.9.1: * updated database engine; + show current record number (need enable in Setup dialog). * other fixes. Ver 1.9.0: * updated database engine; + add support for VIEW's. 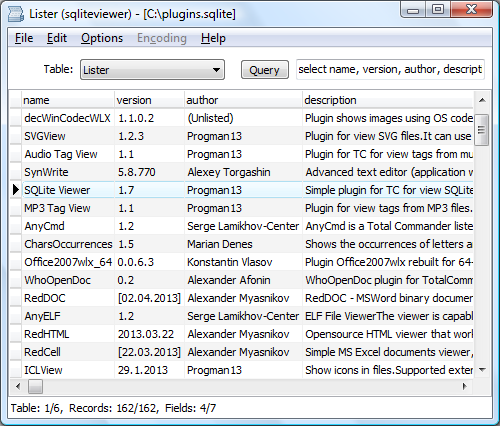 + SQLiteViewer.ini for manual setup: [SQLiteViewer] AddVIEWs=1 - add VIEW's to the table list (default 1) + Setup dialog (menu item Setup...); * other fixes. Ver 1.8.7: * updated database engine; + filter options Not Contain and Just Not Empty. Ver 1.8.6: * updated database engine; * now filter for unicode words supports case insensitive and can use options from standard TC Lister search dialog (F7); + simple filter dialog. Ver 1.8.5: * updated database engine; + simple filter using LIKE for all fields, standard TC Lister search dialog (without options) (F7). Ver 1.8.4: * updated database engine; + new DetectString extensions: sqlite3 and fossil (reinstall plugin or add it manually). Ver 1.8.3: * updated database engine; + support tables created with "WITHOUT ROWID" phrase (https://www.sqlite.org/withoutrowid.html). Ver 1.8.2: * updated database engine; * plugin recompiled in Delphi XE4 for stbility issues on x64 versions of Windows; + show table info in SQL format; * wrong sorting when right click on grid header and next any inside; * other fixes. Ver 1.8.1: * other fixes. Ver 1.8: * updated database engine; * database opens as read only now (PRAGMA query_only); * fixed show tables with spaces in name; + double click on grid row opens Record View window; * BlobAsTextLimit may be increased up to 2000 characters (20..2000, default 150); + SQLiteViewer.ini for manual setup: [SQLiteViewer] ShowTablesCombobox=1 - on/off tables combobox (default 1) StringLengthLimit=255 - characters limit for string (20..2000, default 255) ! Warning. After set up limit for Blob and string bases with huge records may not be opened by out of memory. SkipSystemTables=0 - don't add to list tables whose names starts from "sqlite_" (default 0); * other fixes. 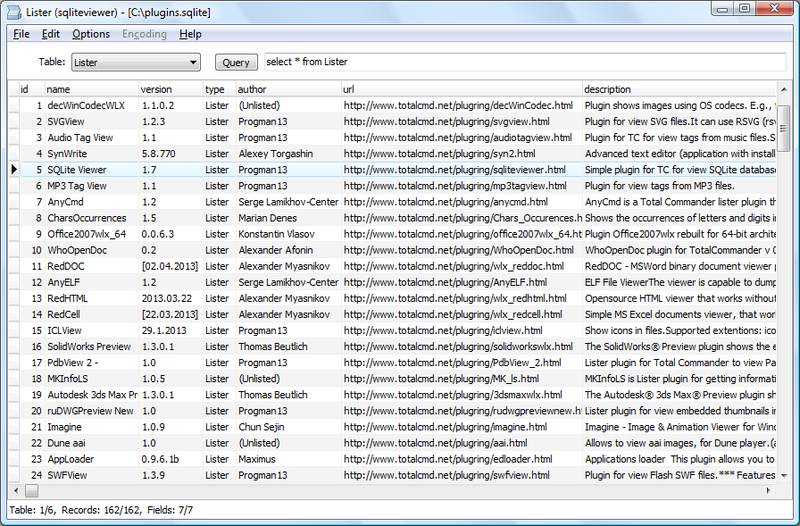 Ver 1.7.6: * may be used standard lsplugin.ini for read settings. Ver 1.7.5: + SQLiteViewer.ini for manual setup: [SQLiteViewer] FixDrawErrors=1 - in some cases remove flickering FixScrollError=0 - do not go to first column when scroll using thumb FixDrawScrollError=0 - when FixScrollError=1 in some cases remove flickering (on old PC is slow) GridOddRowOtherColor=1 - use other color for odd row GridOddRowColor=$00F4F4F4 - color of odd row; Ver 1.7: + some BLOB fields displayed as string now; + tables list panel can be displayed (switch on in ini); + SQLiteViewer.ini for manual setup: [SQLiteViewer] ShowTablesPanel=0 - on/off tables panel (default 0) BlobAsText=1 - on/off BLOB fields as text (default 1) BlobAsTextLimit=150 - characters limit for BLOB as text (20..255, default 150); * other fixes. Ver 1.6.2: + current record can be copied to Clipboard as CRLF separated strings. Ver 1.6.1: * some UI changes; * other fixes. Ver 1.6: + columns autosize when open table (check limit to 1000 records for speed purposes); + column autosize by double click on columns divider; + sort by column header clicking; + table info; * other fixes. Ver 1.5: * more SQLite database files support; + new DetectString extension: sqlite (reinstall plugin or add it manually); * bug fixes. Ver 1.0: * public release.